The Artists Who Came in from the Cold: From Siberia to the Stanford Hotel The Artists Who Came in from the Cold: From Siberia to the Stanford Hotel, brings together three photographers who over a span of 10 years photographed in different parts of Russia. Seen together, their black and white images create an elliptical link between a village in Siberia in winter, a beach in Kaliningrad, an apartment in St. Petersburg, and a hotel room in New York. They speak of the breadth of a culture but also the ways in which outsiders to a culture thread impressions and encounters into an evocative tapestry of associations, both personal and mythic. The three photographers–French, Brazilian, and American–separately traveled to different parts of Russia and later saw each other’s work in New York. All having a strong relationship to cinema, and close relationships with each other, they accentuate the use of black and white grainy effects, mood, and atmosphere to create a cinematic tension in their documentary work. Creating a strong connection between these three perspectives, The Artists Who Came In From the Cold combines a sense of objective documentary description with subjective, diaristic narrative, and because of the shared use of 35mm and black and white film, the photographs cohere into a consistent view of a confounding culture. The title of the exhibition is taken from John LeCarré’s novel, The Spy Who Came In From the Cold, about a British agent in Berlin during the Cold War, made into a Hollywood film in 1965. The French photographer Emile Hyperion Dubuisson, (who moved to New York in 2006 after years in Paris working as a cinematographer with some of the leading directors of the new French cinema), went to Siberia when he was 18 years old in the winter of 93-94 with a French-Belarussian film crew to make a documentary about a remote village in the middle of winter. As soon as he got there, he became ill, so instead of working with the crew to make the film, he took his own still photos of village life as he recuperated. When he got back to Paris and developed the film, he accidentally underdeveloped his negatives, and they were too thin to print; he gave them up as lost and never thought about them again until 15 years later when, now living in New York and working as a still photographer, he tried to recover them through digital scanning and printing. From this vantage point in time, the “lost” but rescued material offered many surprises—basically, the charm and beauty of his young, wide-eyed perspective on a world completely different from his own—such as pictures of a woman proudly displaying a big fish, villagers skinning reindeer in the snow, and an omnious picture of a helicopter descending into the village during a snowstorm. Allen Frame, one of Dubuisson’s photo teachers at the International Center of Photography in New York, admired this Siberian work, and encouraged Dubuisson as he compiled the images into a book and included them in various group exhibitions. Frame’s own aesthetic for many years involved using high-speed black and white film and overdeveloping it to emphasize the grain. He had also been to Russia, four times, from 2000-2002, teaching photography workshops to college students and presenting a photo slide projection project about AIDS in various cities. 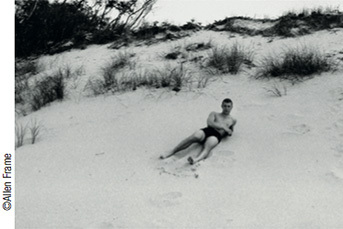 In New York, in 2004, he had the chance to meet and photograph some young Russian video artists in their rooms at the Stanford Hotel – including Evgenii Palamarchuk- who were showing their videos at the contemporary art space Art in General, brought to New York by CEC Artslink, which had sponsored Frame’s own travels in Russia. Mauro Restiffe, from Sao Paulo, studied at the International Center of Photography in ’94/’95, and went to St. Petersburg in ’95 twice, first with his Russian girlfriend, then later that year by himself after they had broken up. The pictures that he made there, still lifes, environments, and portraits in her mother’s apartment, proved to be seminal in his body of work, with their interest in the role of portraiture as artifact, icon, and memento. After creating a signature style of large-scale grainy images made from 35mm negatives that have been presented internationally, he returns to these early, intimate, small-scale photographs that reference a specific time in his life and his awakening to the content that arises with the intersection of private and public space, the social and the political. Emile Hyperion Dubuisson was born in Paris and is living in New York. Prior to his photographic studies at the International Center of Photography in 2007, he studied cinema at Université Paris 8 in France. His work is informed by the disciplines in both fields. He has been widely exhibited in the US. Foam Magazine awarded him as one of the its Talent 2010 artists. He recently received the Juror’s Choice award in the Project Competition 2011 Center Santa Fe’s, honors documentary projects and fine art series. He was already part of first presentation of this exhibition of K10, under the title “Gli artisti che giunsero dal freddo. Dalla Siberia allo Stanford Hotel”, at the Centro Luigi di Sarro, 2013 in Rome.The photos from his stay in 1993/94 in Siberia were published in a splendid book, titled FAR, published by ADAD Books, London, 2013 in a regular edition of 600 copies and was also available in a special edition of 35 copies with a signed and numbered print. Allen Frame lives in New York where he teaches photography at the School of Visual Arts, Pratt Institute, and the International Center of Photography. He has also given photography workshops in Mexico City, Oaxaca, Tijuana, Monterrey, and in Russia. His book Detour, a compilation of his photographs over a decade, was published by Kehrer Verlag Heidelberg in 2001. He is represented by Gitterman Gallery in New York where he has had solo shows in 2005, 2009, and 2013. His work has been included in exhibitions at the Museum of Art of the Sonora in Hermosillo, Mexico, the Baltimore Museum of Art, the Fotomuseum in Winterthur, Switzerland, Schedler Galerie in Zurich, Galerie Polaris in Paris, and Leslie Tonkonow in New York. He has been the curator of numerous exhibitions, including Darrel Ellis in 1996 and In This Place in 2004 at Art in General in New York; Bearings: the Female Figure at PS122 Gallery New York in 2006; and Anatomy, Persona, and the Moment: 70’s Experimental Photographs of Luigi Di Sarro in 2010 and Linda Salerno: A Selection of Experimental Photographs from the Black Mirror Series in 2011 at the Camera Club of New York. Frame’s work was already part of the first presentation of this exhibition of K10, under the title “Gli artisti che giunsero dal freddo. Dalla Siberia allo Stanford Hotel”, at the Centro Luigi di Sarro, 2013 in Rome. He has been serving many years actively on the Board of Camera Club of New York, which was founded by Alfred Stieglitz in 1884 and is still active in the community of artist-photographers. (See more extensive Biography in Bulletin #001, for the workshop). Mauro Restiffe, born in 1970, lives in Sao Paolo, Brazil, where he is represented by the Galeria Fortes Vilaça. He studied at the FAAP University in Sao Paulo and the International Center of Photography in New York and was a Visiting Scholar at New York University from 2001-2003. His solo exhibitions include “Recorrências” at Galeria Fortes Vilaça in São Paolo, Brazil, Mirante at PhotoEspana09 in Madrid, Spain, ” Vertigem” at Galeria Maria Sequeira in Braga, Portugal, and “In Process” at Henry Urbach Architecture Gallery in New York. In 2012 he had a solo show at the Museu de Arte Contemporânea, São Paulo. He has participated in many group shows including the BESPhoto Awards in Lisbon in 2011, the 27th Sao Paulo Biennal and the 2006 Taipei Biennial. He is recipient of the Fellowship ApArtes from the Ministry of Culture, Brasília, The Louis Comfort Tiffany Biennial Award, NY and The Rema Hort Mann Art Grant, NY. Was already part of first presentation of this exhibition of K10, under the title “Gli artisti che giunsero dal freddo. Dalla Siberia allo Stanford Hotel”, at the Centro Luigi di Sarro, 2013 in Rome. Restiffe will present an extensive selection of his photos from Russia, also recent ones, for the opening exhibition of the new “Garage Museum of Contemporary Art” in Moscow from May to September 2015. The museum will publish a new publication on his early Russian photographs,which are also part of our exhibition. His work is in the permanent collection of the TATE Modern, London, SFMOMA, San Francisco, CGAC, Santiago de Compostela, Thyssen Bornemisza Art Contemporary, Vienna, Museu de Arte Moderna, Sao Paulo, Inhotim Instituto de Arte Contemporânea, Minas Gerais, among others.